Workers have the ability to collectively bargain for wages, benefits, and working conditions in the private sector if they desire. If they make their labor too costly and businesses can conduct their operations elsewhere, then they have the right to do so, too. The government has no legitimate role in forcing business owners to be hostages to their workforce. If the workers price themselves out of their jobs, then they need to deal with the consequences. The ability to collectively bargain does not include a guarantee of a job. we all pay higher prices for the same product or service — and for Boeing, which competes against the EU’s Airbus, it will mean lost sales and less work altogether in the US. Prices of flying will increase, while the taxes that flow from both employment and sales will decrease. Nor will it end there. Such a decision will lock businesses in their present locations and give local and state governments carte blanche to hike taxes and fees, secure that business owners won’t be able to vote with their feet — and leave taxpayers holding the bag when businesses go under and capital stops flowing to the US for investment. Uhhm, since forever is my immediate response. That’s not really true, naturally. But it has been an essential principle of our country since it became apparent what pressures were always brought to bear whenever the secret ballot was not used. Salem witch hunts anyone? That’s essentially what’s happening in Washington with the liberals’ proposed changes to the Card Check rules – the abolition of anyone who doesn’t want increased unionization, by whatever means. Having worked in a union shop I feel qualified to say that it stunk, from beginning to end and top to bottom. The last thing this country needs is to return to the days of fetid corruption when Hoffa’s father ran the Teamsters. Competition No Longer an American Ideal? Michael Lind says that southern states have waged an economic civil war on the rest of America, the real America, in Lind’s mind, by creating an economic environment in which companies want to do business and bringing jobs from the heavily unionized north of the country and from overseas. This, Lind Says, creates wage competition that harms American workers and America’s viability as an international economic power. Is he right? Should Americans workers demand an end to competition in labor markets? Absolutely not. What Lind calls a race-to-the-bottom rivalry between the south and the rest of the country is really the pursuit of economic efficiency, a necessary action in a country whose labor costs far exceed those paid to workers in most of our economic competitors. What of it? Is a Massachusetts company obligated to keep its textile mills open even as they bleed the company dry by losing money year after year? Must a manufacturer in Michigan keep an automotive plant running at a loss simply because they chose Detroit as a location for the plant 30 years ago? No. Businesses are obligated to meet the commitments they expressly make to employees, of which there are relatively few: make payroll on time and in full, supply promised fringe benefits, meet or exceed safety standards, provide compensation for on the job injuries, and keep other employee/company-specific promises. That’s it. There has never been any guarantee of lifetime employment in any industry, no matter how venerable and/or wealthy the companies. Nor should there be. Workers who face no consequences for slovenly work, absenteeism, and safety failures, among others, will inevitably commit these offenses with increasing regularity. Spend time in any union shop and you’ll understand this quite clearly. Lind champions unions in spite of the evidence against them. Nothing could be more damning than the effects unionization has had on Detroit’s Big 3 automakers. Yet Lind blames southern states’ efforts to entice Nissan, etc., to do some of their manufacturing in American as the problem. In his mind, Americans would be better served by having either excluded foreign automakers from the U.S. manufacturing sector or to have forced them to accept a union work force. The former was certainly an option, though hardly desirable; the latter would never have happened. Japanese automakers would never have agreed to those terms, knowing full well that drinking the unions’ Kool-Aid would have been akin to slugging it down while in Jonestown. Call it the Third Reconstruction. The first step is to end the race to the bottom in wages and regulation, by national action. The national minimum wage should be gradually raised until it is a living wage, of $10 to $12 an hour, and it should be adjusted for inflation. At the same time, federal regulations should set a higher floor with respect to worker safety regulations, environmental regulations, and others, preventing America’s own internal rogue states from gaining any advantages by flouting national standards. Most Southern politicians and business leaders will howl that this will bankrupt the South. That’s what they said about the abolition of slavery, child labor, and the convict lease system, too. The South was a better place to live after those reforms, and it will be a better place to live when there is a living wage throughout the South. Were such legislation to be introduced it would undoubtedly be given a more circumspect name. Lind is too honest for his own good – he’s actually acknowledged his purpose by calling for the reconstruction of America’s competitive economic culture. How gauche of him not to wrap it up in a glitzy package with a cute bow on top. The core problem with what Lind wants to do, economically speaking (there are others, the deliberate destruction of the conservative Christian, Republican south, for one) is that there’s no such thing as a "living wage". Congress has mandated a minimum wage, right enough, but that’s not what Lind and other progressive types want. What they want is a floor for wages below which no employee can fall, regardless of how few abilities he or she brings to the table, how incompetent his/her work might be, or how little value the employee brings to the organization. This last point is essential. Employees must bring value to a company, value in excess of the resources that they consume. Otherwise the company eventually dies. Would a custodian, for example, bring $24,000 worth of value to a bank, for example? Unlikely. Perhaps in an upscale hotel or resort that attracts an elite clientele who expect the posh treatment, but not in most businesses. Forcing wages above the value of the work an employee performs is a death sentence to employers. It amounts to little more than another welfare program, albeit somewhat disguised in the form of taxable payroll "earnings". American businesses or the southern states do not need to be reconstructed. Rather, idealists like Mr. Lind need to realize that businesses will always pursue the combination of low-cost, high-skill labor wherever it exists, inside or outside America. Punishing the southern states that brought Nissan and other foreign automakers into America and created thousands of new jobs while lowering the cost of good-quality vehicles in the process makes no sense at all when looking at the big picture. Reality cannot be legislated away. That’s the primary reason why the Senate rejected the planned bailout of Detroit’s automakers and that’s why the government must not succumb to the temptation of guaranteeing a living wage to those who don’t perform work that warrants such a figure. Perhaps the fundamental problem of our time is that no one wants to tell – or hear – the truth anymore. This has certainly been true in Detroit, et al, where the United Auto Workers has fought off wage and benefit cuts for decades. Now GM is poised at the brink of bankruptcy as a result. 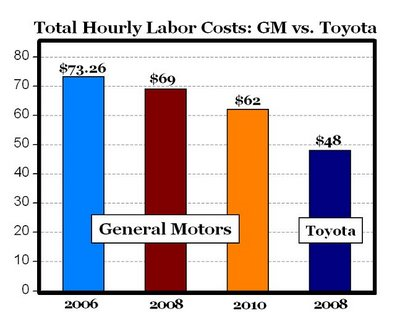 Loaning GM money would be viable if labor costs were reduced as part of the agreement. But like others on the left, whose support for unions blinds them to reality, Eric Hoehlert still denies that there’s a fundamental problem with the cost of GM’s work force. Hoehlert’s assertion that the media is biased against blue-collar workers and against auto unions doesn’t make sense to me. Nor does his superficial claim that UAW workers don’t make the hourly rate that the Times, et al, reported. The unpleasant truth that Hoehlert buries in parentheses at the end of his thesis is no mere footnote, it’s the entire point and problem with Detroit, one that can be summed up in a single phrase – total compensation. For GM, the problem isn’t so much the current wage of an assembly line worker, it’s the current and historical obligations the company has in addition to base salaries. Like an anchor dragging bottom, the obligations demanded by auto unions are a dead weight that has killed GM’s momentum and threaten to drag the entire company down. The thinking that led workers and union leaders to make unrealistic demands – demands backed by threats of strikes and violence against non-unionized workers – are the primary cause for automakers’ financial crisis. 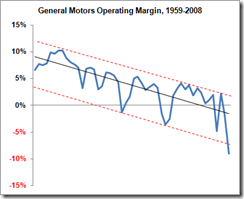 It’s easy and popular to blame GM’s management for what has happened to the company. But does anyone truly believe that GM would be teetering on the edge right now if their employees’ total compensation was in line with Toyota’s? The truth that Hoehlert and others can’t bear to admit is that the leftist policies of unionization and wage and job entitlement have inevitably brought Detroit to this moment in history. Faced with nimbler, more efficient competitors, sluggish, sloppy union shops simply cannot compete. It has always been so and always will be. Should Congress now bail out companies brought to destruction by these policies? Actually, yes. We need a domestic source of cars and trucks. But taxpayer money should only be loaned to Detroit with the attached string of rectifying the fundamental problem of unionization. Still, good advice. As it happens, I was contemplating the nature and depth of Barack Obama’s relationship to the country’s unions recently and I’m hopeful – there’s that word again! – that he will give them the cold shoulder now that he’s the kingpin around the U.S and decline to endorse unions’ dangerous proposal to change "card check" rules. That would put a smile on my face! Indeed, an Obama rejection of union muscle would be a good thing. 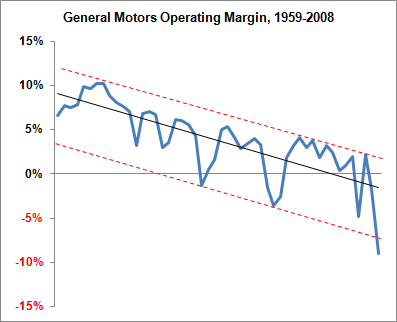 This should be particularly obvious given what has happened to General Motors as a result of being held hostage by its unionized work force. But I’m supposed to be lightening up. Rats. I did try. There were two guys working for the city. One would dig a hole — he would dig, dig, dig. The other would come behind him and fill the hole — fill, fill, fill. These two men worked furiously; one digging a hole, the other filling it up again. A man was watching from the sidewalk and couldn’t believe how hard these men were working, but couldn’t understand what they were doing. Finally he had to ask them. He said to the hole digger, "I appreciate how hard you work, but what are you doing? You dig a hole and your partner comes behind you and fills it up again!" The hole digger replied, "Oh yeah, must look funny, but the guy who plants the trees is sick today." And that’s why GM may go bankrupt, your honor. I am a transplanted Texan, having been born and raised a Hoosier in Indiana before moving to Texas for my senior year of high school. I liked to read when time permits and my favorite book of all is "Atlas Shrugged" by Ayn Rand. I was the last male Moore in our family line until my sons arrived on the scene, all 3 of them. I became a Christian at age 40 after God touched me and said, "I’m real and this may be your last change to get on-board." I’ve been working on a long political/sci-fi novel for a few years now as time – the limiting factor, again – allows. I can now safely predict that 2008 will NOT be the year it is completed! Although I’ve got "white man’s hops" and never played basketball while in school, I’m a big gym rat and always looking for a pick-up game. In fact, there’s one on tap for tonight. Marc Schulman – Marc, where have you been? Back in the day Marc wrote some awesome posts, particularly this one about George Orwell and the left. Also, I dig his first name! Chuck Moore – My dad keeps a low-key blog, which probably helps to keep his blood pressure down. David Broussard – A good friend with a keen mind who has been way too quiet in the blogosphere lately. Russell Miller – A self-described left-leaning independent I’ve had the odd back-and-forth with. Sadly, Russell seems to have stopped blogging. Hopefully he’ll come back to it. Sister Toldjah – Another good conservative voice who never seems to run out of energy to promote conservative values. Rock on, sister. The Wall Street Journal says that Wal-Mart is getting the word out to employees that electing Barack Obama would be bad for business and increase the likelihood of unions taking over in the companies stores. Both of these changes would be hazardous to employees’ future job prospects, the company insinuates. Lefty bloggers are “stunned” and “outraged” because the company dared to tell its employees about the facts of life, facts the left wouldn’t want people to know, as it happens. Unions, after all, are formed with the sole intent of obtaining a higher-than-market wage for its members. Assuming a free market, by definition no worker can be exploited, in socialist parlance, because jobs pay a wage that equals the value of the work. These are hard, incontrovertible facts observed in the work place that, IMO, cannot be denied. So Wal-Mart is supposed to simply roll over and allow employees to dictate terms by force, which is what a union demand is, in its naked form? Despite its massive profits and hefty responsibility as an employer, Wal-Mart has done little to improve the lives of its employees. Wages at the company have actually declined since 2004, and the company’s political involvement shows its commitment to keeping wages low. What “hefty responsibility” does an employer actually have to an employee? There are many, actually, but pay increases of the desired amount and the provision of an arbitrarily-defined standard of living are not among them. It should go without saying that an employer’s first responsibility is to its owners, namely to make maximum profits over the long haul. To stay in business, in other words, and do better than the competition while operating within the law. Second, employers are obligated to take excellent care of key employees. Not out of altruism but rather to serve the first responsibility. Third, a corporation is responsible for meeting the commitments it chooses to make to its employees, whether integral or dime-a-dozen. Payroll is to be timely and accurate, benefits to be provided as promised, etc. Unions attempt to add additional obligations to companies via the collective bargaining arrangement. In doing so they create barriers to employment and termination. Good people cannot be hired if they refuse to join the union or are blackballed for whatever reason. Bad employees cannot be fired, even for cause, because of the union. The bad character of union shops is almost mythical and for good reason. If Wal-Mart’s employees are so miserable they should simply quit and find other jobs or start their own small businesses. Wal-Mart was built by a single man – the next big company could easily be created by a Wal-Mart cast off, though that possibility would be diminished greatly by the unionization of the company. Truth is many Wal-Mart employees are happy in their work. I know a friend of mine, a man in his mid-50s, has turned down several other opportunities to continue working there as a common, ordinary employee. He likes it. Period. Barack Obama would probably not be a disaster for Wal-Mart. But McCain would be better for America and for the company. Why not just say so?